If you are planning to make that great escape from Brisbane or Gold Coast, or if you are a tourist wanting to reincarnate the beach bum inside you, why not rent a car from one of our leading suppliers and drive comfortably to Sunshine Coast? We compare all major car rental brands such as Avis, Budget, Thrifty, Europcar, Enterprise (formerly Redspot) and Hertz. Nothing could be more romantic than driving leisurely with that special person, and leisurely driving means not having to worry about your safety and security, just driving your rental car with comfort and knowing you are taken care of. Why rent a car in Sunshine Coast with VroomVroomVroom? At VroomVroomVroom, we make booking a car hire easy, so there are no excuses for not securing a great and reliable car hire in Sunshine Coast. We provide a list of car rental deals from the top suppliers and their depot addresses in the lower left hand bar, so you can easily choose where is the most convenient place for you to collect your car. No Cancellation Fees, feel safe in knowing that if your plans change, you will not be charged. It is always best to book ahead, no matter where you are picking up from. The best thing about our site is we do not ever hide fees. $0 Booking Fees or Credit card details required to make your booking. SAVE! On time and money by comparing all rental deals at once. Best car rental rates available, or we will match it and give you $20. Our Price Promise assures you of getting the lowest rate in hire cars. We have been helping drivers to book hire cars for over 10 years. We can help you find a vehicle that fits your budget and preference. You can also book a campervan hire through us. LIVE chat, provides real people to help you with your booking instantly.Should you have any questions, our customer care experts are ready to help you. Contact us and we will do our best to answer all your queries as soon as we can. Golden beaches is an attraction of the Sunshine Coast that must be experienced with the convenience of a car. With kilometers of coastline, you can definitely catch a wave or two and soak up some sun. Although to the locals, the water is considered cold in the winter months, tourists from all over the world swim all year round. 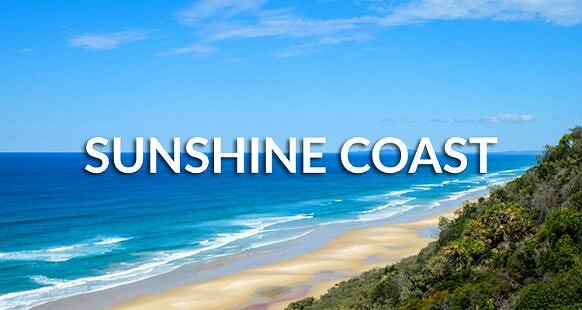 Weather-wise, September to November is the perfect time to go to the Sunshine Coast. Experience Bicentennial National Trail which is the longest marked walk track in the world. It has more than 5000 kilometers long and on the part passing Sunshine Coast, you can admire the trails of the early pioneers. On the Sunshine Coast side of the trail you can also catch a side of the typical flora and fauna of this part of Australia. If you enjoy surfing, the best time is during autumn and winter, from March to September, while if your kids love the zoo, you may want to avoid the Australian school holidays. The Sunshine Coast is a tourist region in Queensland, about 75 minutes north of Brisbane, located on the coast of the Pacific Ocean. The major arterial roads, which pass through most major areas of the Sunshine Coast are The Nicklin Way & Sunshine Motorway . Its population of about 270,000 means that it grabs the 9th spot in Australia's largest metropolitan areas. Some of the notable beaches from Sunshine Beach near Noosa to Coolum Beach is 17 km, the coast from Point Arkwright to Mudjimba is 11 km, the Maroochydore–Mooloolaba stretch is 5.6 km, and from Buddina past the Caloundra CBD to Pelican Waters is 22 km via rental car. If you are in search for an alternative beach holiday destination or want to escape the crowd on the Gold Coast, then the Sunshine Coast is the place to be. Still fairly untouched in terms of major developments, you can enjoy the city more by booking a car rental. Since the city is bordered by unbroken beaches, you can expect many breathtaking scenery as you travel by car or campervan. To make your holiday or business trip more memorable, we have come up with a list of things to do, accommodation, and dining options so you won't have a hard time choosing where to go, stay or eat. Coolum Surfing School is a family owned and operated business since 2001. They cater for everyone needs – individuals, families, school camps and large corporate groups who want to wash away their worries. Learn to surf with one of Coolum Surfing School's local and professional surf instructors (male or female) all very experienced and competent surfers who's passion is passing on the “stoke” of surfing. Give yourself the thrill of a lifetime and enjoy the natural high of surfing while also having a great physical and fun workout! A trip to the Sunshine Coast won't be complete without heading to the beach. One of the most popular activities in the area is kitesurfing and you can learn that by taking up the lessons offered by Adventure Sports. They are the only approved kitesurfing school in Noosa and you are assured of learning from the best since all of their instructors are IKO certified. Experienced kitesurfers, on the other hand, can hire a great range of equipment from Adventure Sports. Ikatan is Sunshine Coast's premiere Day Spa destination. It is just a short drive away from the airport and Mooloolaba, and a few minutes away from Noosa, Coolum, Peregian Beach, and Sunshine Beach. 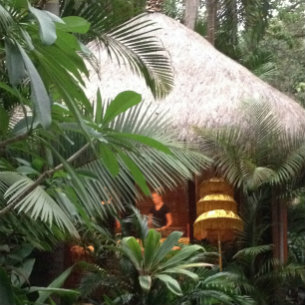 Ikatan Spa is nestled in a private oasis not like other day spas that are situated in a hotel or resort. After a long day of touring and sightseeing, take time to pamper yourself with a luxury spa treatment followed by a glass of champagne or a pot of delicious tea. Australia Zoo, dubbed as The Home of the Crocodile Hunter, is a 100 acres zoo owned by Terri Irwin, the widow of Steve Irwin. Visit the zoo which was opened on a small area in Sunshine Coast by his parents in the 70's and developed through the years. As a child, Steve Irwin loved to help with the reptiles and crocodiles, hence the job he eventually had. The zoo contains over 100 species of animals and birds and some beautiful permanent exhibitions that you should not miss: The Crocoseum, Elephantasia and Rainforest Aviary. Bellingham Maze is a huge attraction from Sunshine Coast, suitable for both children and adults. Discover the huge maze located in Sunshine Coast which is not only lovely for long romantic walks, but also for team buildings, picnics or outdoor coffee breaks. The attraction also has two mini-golf courses which were recently built. Another fun thing to do in this place is bird watching as the maze houses approximately 100 species of birds. At Malene Dairies, it's all good! Come on one of their farm and factory tours and learn all about the process of milk from the cow to the bottle and everything in between! You can expect to get up close and personal with one of their Guernsey gals, meet their calves and get your hands dirty feeding the animals. (Tip: Their Springer's are fed at 10am so come along then to get involved). 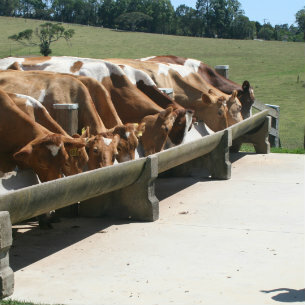 The two morning and two afternoon tours all include a visit to the dairy to see where the cows are milked. Their cows are milked at 3pm so come on the 2:30pm tour if you want to see it in action! They also see the factory where the milk is processed and then bottled. And of course the tour wouldn't be complete without sampling their range of award-winning products. The tour is educational and great fun for all ages! You may want to spend a bit more time on the farm to enjoy a coffee and let the kids run around. So bring a picnic or make use of the BBQ's. The choice is yours! *Please note that Maleny Dairies is a working factory and due to factory operations and construction, it is not always possible to access all areas of the tour. Want to create memories that will last a lifetime? Then why not experience the handcrafted beauty of a classic wooden speed boat. The award-winning Noosa Dreamboats Classic Boat Cruises has stunning mahogany classic boat which was hand crafted in the USA in the style of the timeless 1940's and 50's American powerboats. Noosa, on Queensland's Sunshine Coast, is famous for its wonderful climate, extraordinary natural beauty and spectacular waterways. It is the only place in Australia where you can experience the excitement and glamour of riding in a classic speed boat. Are you ready to create amazing, special memories? Award-winning Sunshine Coast Afloat is a local family business based in Mooloolaba on the beautiful Sunshine Coast, which delivers outstanding marine and adventure experiences. They aim to provide people who are caught up in life's everyday struggles, the ability to simply get away from everything and enjoy some time on the water providing remarkable service and real value for money. Furthermore, they aspire to rejuvenate and refresh their guests by offering them a variety of water-based activities such as Deep Sea Fishing and Crabbing Charters, Ocean Jet Boat Thrill Rides, Whale Watching without the crowds, Guided Kayak Fishing Tours, Coastline and Canal Cruises for all occasions. Want to learn how to dive? Scuba World specialise in teaching safe, fun and extensive 4 day learn to dive courses. These courses are mainly aimed at locals who plan to take up scuba diving as a life long sport. Escape everyday land and come scuba diving with Scuba World today! Are you ready to do something different? 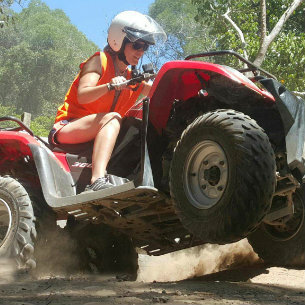 A unique and exciting way to explore Noosa Hinterland, is with the Sunshine Coast's best and only quad bike adventures. Half day tours to Woondum National Park depart twice daily from your Noosa accommodation. Woondum is a breathtaking area with picturesque rock pools, subtropical rainforest, and rocky creeks, with free flowing water. Ideal for a quad bike experience. The quad bikes are fully automatic and easy and fun to ride, ensuring a thrilling experience in one of the most beautiful areas of Noosa. You must hold a current drivers licence (motorbike or car) but no experience is necessary as full training and safety gear are provided. If you are going to experience a quad bike adventure, there is truly no better place to do it in! Trips includes: return accommodation transfers from Noosa & surrounding areas, full training & safety gear, drinks & snacks and 2.5 hours quad biking. Spinnaker Quays is known for its quiet surrounding and convenient location. It is situated between the Mooloolaba Beach and Mooloolah River and has easy access to The Surf Club, The Bowls Club as well as a number of boutiques and coffee shops. Spinnaker Quays' lovely accommodation is perfect for families and group of friends travelling to the Sunshine Coast. They have three-bedroom, two-bathroom apartments as well as one and two-bedroom apartments. Situated right in the heart of the Sunshine Coast, Beachside Resort Kawana is quite popular among tourists and locals because of its accessibility and world-class facilities. It is just a stone's throw away from the pristine Buddina beach and five minutes by car rental from Mooloolaba. They offer one to three-bedroom apartments and a luxurious ocean-view penthouse apartment. Take advantage of their swimming pool, spa, sauna, gymnasium, and free Wi-Fi. For a unique dining experience, visit Maleny Cheese Café & Cheesery where you can sample various cheese-specialty dishes and learn how to make dairy products. The café features panoramic windows where you can get a glimpse of the production floor. You can also watch a short video that takes you from the paddock to the plate. Enjoy free cheese and yoghurt tastings as well as take-away cheese platters everyday. 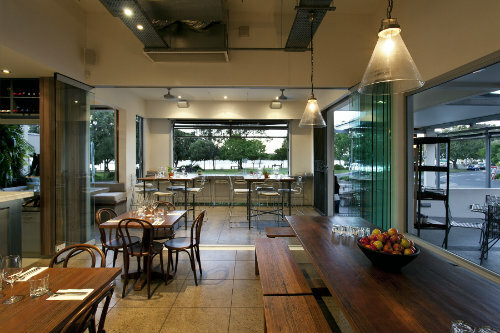 If you're in search for great food, relaxing ambiance and amazing views, then Thomas Corner Eatery is the place to be. They offer casual style dining everyday with an impressive menu prepared by celebrity chef David Rayner. He developed a new menu that features fresh ingredients and local produce. The eatery also has an extensive list of wines and cocktails. The award-winning venue with multiple clubs, entertainment and restaurants provides world-class enjoyment on the Sunshine Coast. Choose from their four restaurants: Aura Ocean To Plate, Viva, Clearwater Café, and Aura – Training Restaurant. Apart from their superb dining options, they also have four bars to choose from: Miss Ruby, Raw Health Bar, Indulge Espresso Bar, and Sports Bar. Feedback: Really easy to book and compare. Loved it. Feedback: All good so far! Feedback: Very straightforward and quick. Avis Maroochydore - 74A Aerodrome Road, Maroochydore, QLD. Budget Maroochydore - 74b Aerodrome Rd, Maroochydore Qld, QLD. Hertz Maroochydore Downtown - 6 / 28 Aerodrome Rd, Maroochydore, QLD.